This place has beautifully appointed rooms, the grounds are immaculately manicured lawns and best of all the pool is huge and it’s near the bar . Since we got a suite on the third floor we got a great overview of the resort grounds. The price you found is 23% lower than this hotel's average rate of $181/night. The price you found is 11% lower than this hotel's average rate of $280/night. Offers & AnnouncementsHOT SUMMER TRAVEL DEAL! The price you found is 23% lower than this hotel's average rate of $103/night. 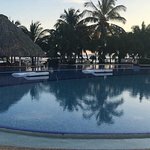 The Placencia resort was very beautiful, clean, and comfortable. The staff was very friendly and efficient. The rooms were cleaned three times during the week we were there. The only issue at all was the WiFi was spotty. We would definitely stay again. 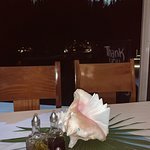 I have visited TPR for a number of times in the past few years and it had always been a lovely experience not only form quality stay, lovely surrounding (beach) and flawless service.This time i was sadly surprised with the type of service they offered at the restaurant and pool areas. The common areas of the hotel require pest control programs and the beach was full of seaweed and loose seaweed that instead of taking it out they throw it back hoping that the stream would move it (not happened) we didn’t use the beachfront privilege.I hope that they can improve this aspects as the location is beautiful; the infrastructure is good but the experience this time owed me. Thank you for taking the time to leave a review. We appreciate all feedback as a way to improve the typically stellar service and experience for guests. We are proud to announce we now spray daily for insects and other pests throughout the grounds. In rare cases, we experience an influx of insects depending on weather patterns. We always offer complimentary bug spray for guests throughout common areas. From time to time, weather patterns also affect seaweed washing up on the beach. The team works around the clock to dispose of seaweed and other debris that sometimes washes up on the beach. If at any point you have any issues with your room or amenities, the front desk can be reached 24/7 through your complimentary room phone. 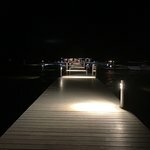 After walking down a beautifully lite dock we arrived at the restaurant. Our waiter offered to move our table from underneath a grass covering to being under the stars. So romantic! We had a wonderful and relaxing stay. This was the second time we came and will definitely be coming back. We brought our daughter and her fiance this tine. They enjoyed themselves as well. The pool was awesome. Room tip: I don’t remember. We enjoyed our week at the resort. It was quiet the week we were there and allowed us many days to sit by the pool in peace and quiet. The resort is about 20 minutes from town and is an easy drive. The staff were all very friendly and food was good.